Royal Purple. White and silver are unofficial complementary colors. Clap and bend to do the “the Wabash,” K-State’s own version of “Wabash Cannonball.” The song became a second fight song when the music department lost all music except the “Wabash Cannonball’ in a 1968 campus fire. The band director had taken the music home to arrange for the band, and only that music was saved. Looking for a sweet treat? You can find more than 30 flavors of student made ice cream at K-State’s Call Hall Dairy. Only the dairy manager of Call Hall knows the official recipe for the Purple Pride blueberry ice cream. Willie the Wildcat electrifies Bill Snyder Family Stadium with his K-S-U chant and pose after every scored point. K-State students show their pride by following his lead beyond the roar of a home football crowd. 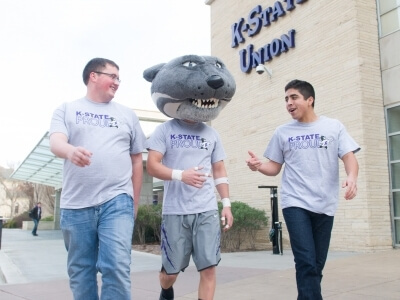 Whether they’re on campus or making their mark across the globe, you can find K-State students showing their K-S-U Wildcat spirit.